As is the norm, Alison and Paul’s wedding celebrations started off with a Mehndi function. The venue was decorated in orange marigold strings and matching Indian prints. She chose to wear an indo-western outfit, pairing a black crop top with a printed blue skirt and a pink dupatta. She even added a bindi to top it off. It was just adorable how happy she looked with all the on-goings! The Sangeet night was a whole lot of classy fun. Alison looked pretty in a sheer white saree with a gold border. She kept her look minimalistic, accessorizing with a simple neckpiece and bangles. Her blouse complimented her mehndi to perfection. Paul wore a sherwani with gold details that went along with his bride-to-be’s attire quite well. Love the ‘Biwi No.1’ prop! The wedding day had Alison stunning us all in a red and yellow-gold lehenga with intricate Zardozi work. She styled it with a minimalist Kundan maang-tikka, nath and statement earrings. Paul himself looked quite dapper in a white ensemble paired with a pink dupatta and yellow safa. 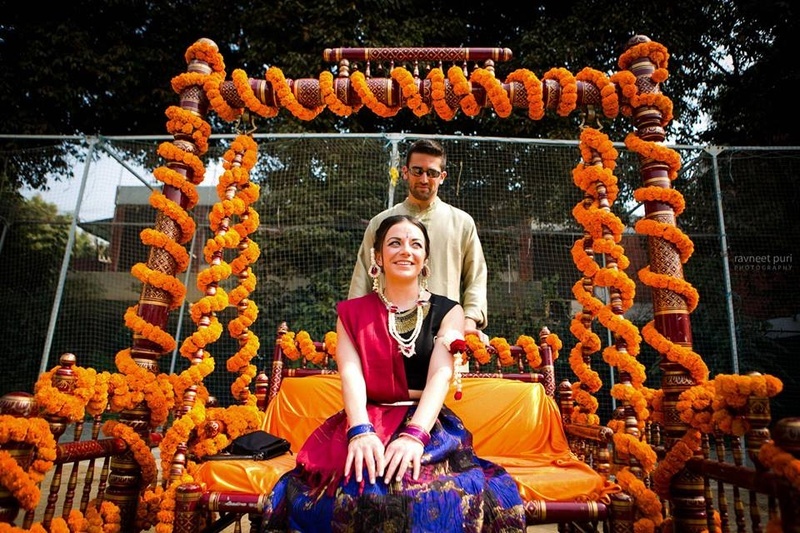 The entire ceremony was full-blown Indian style!